I recently joined a social media Psychology teachers’ group in the hope of sharing and gaining ideas for the teaching of my subject. In one such post I was horrified to read that the writer had her blancmange brains all made and ready to be transported into school for her students to label in their A level lesson. I can fully appreciate why some teachers do this as the moment I ask my students to carry out independent work, they inevitably discuss anything but the activity and then wait for me to reveal the ‘right’ answer. On the other hand, making a model of memory out of match boxes or labelling a blancmange brain introduces enough competition to take their minds off the weekend, Christmas, parents and work at the local burger bar and is tangible enough to show at-a-glance who is or is not working. Perfect! But what purpose does this really serve and who benefits? How much time, effort and money are teachers spending on creating activities such as this when they should be relaxing after a hard day’s work? I suggest that, while fun, such activities have little real value for students or teachers. Blooms taxonomy (https://en.wikipedia.org/wiki/Bloom’s_taxonomy) suggests that to develop skills for advanced level study, university and the wider world, we need to get students to apply knowledge, to use it to create something new and to be able to analyse and evaluate it using evidence. Blancmange brains however, merely model concepts copied from a diagram in a textbook and rendered in 3D. As such they can only help students at the lowest level of this taxonomy, namely, acquiring knowledge. Knowledge which, quite frankly, could be gained from the dusty plastic model brain languishing at the back of the science prep room cupboard. I take my hat off to the wonderful creative teachers out there but I would also like to suggest that they take a well deserved break from being creative and allow the students to jump their own various learning hurdles with the following activity. Give them a diagram e.g. the working memory model below, and a question grid based on Blooms. 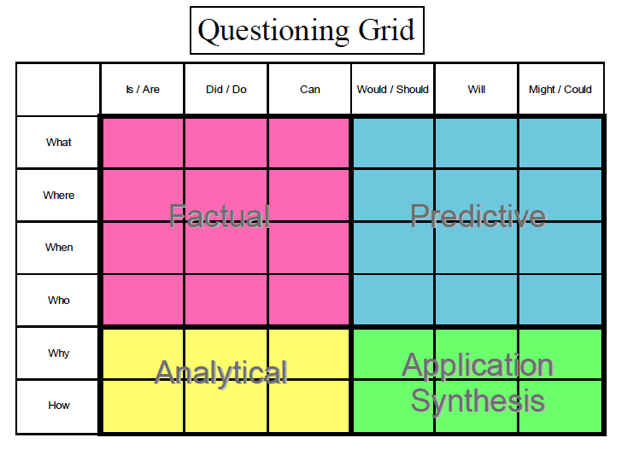 Ask students two write two questions in each quarter of the grid to give a range of questions covering each of the four skill areas. Students start with a word from the column on the left and complete their question using words from the top row, writing their resulting question in the intersecting box. For example, ‘when do we use the acoustic store?’ Then ask them to attempt to answer their questions using their own knowledge, books or the internet. At the end of the activity both they and you will have a much firmer idea of the areas they need to work on to fully understand the model. This takes very little preparation from the teacher (find a picture/model, concept or diagram and print out the question grid) and a good half lesson’s work from them. Win win! Have a great week and a blancmange free weekend.